Hosting guests can be stressful and these gift basket ideas for women will help take the stress away! 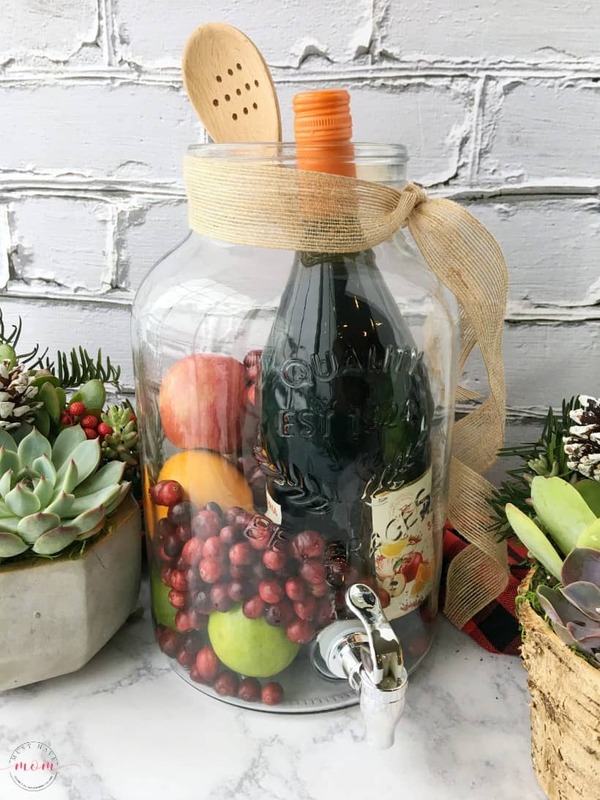 Take some of that stress of your hostess by arriving with this gorgeous DIY sangria gift in a jar paired with a beautiful succulent garden. You’ll be gifting her low maintenance decor along with a ready to serve drink for guests which will definitely take some of the stress off the hostess! I hate showing up empty-handed to a gathering. I’ll show you my favorite gift basket ideas to spoil your hostess and make their gathering a little less stressful and a little more joyful! Let’s start by making the DIY sangria gift in a jar. You’ll need a glass beverage dispenser which you can find at any big box store or on Amazon and they aren’t expensive. 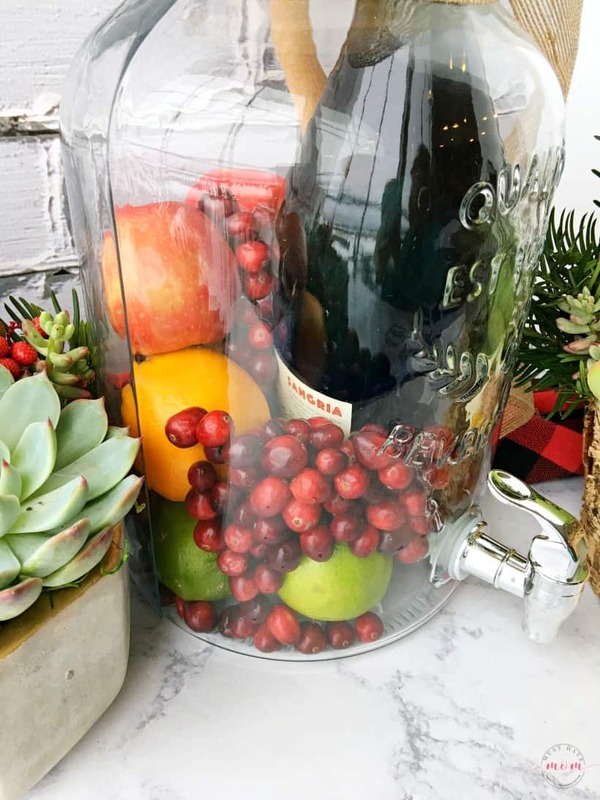 Then, fill the jar with a bottle of Sangria or wine, limes, apples, oranges, and cranberries. Tie a burlap ribbon around the top and include a wooden spoon for mixing. Voila! You’ve got a ready-to-go drink for the party you attend. We can’t stop there though! 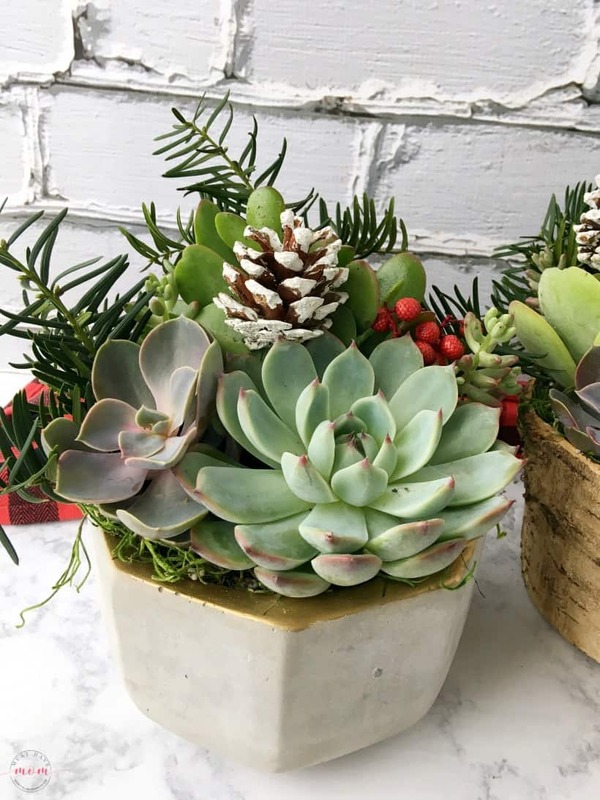 Your hostess deserves a gift that will last all season and this gorgeous Season Greetings Succulent Garden from Jackson & Perkins fits the bill! It’s absolutely stunning and pairs perfectly with the sangria gift in a jar. Succulents are the latest trend in indoor gardening and with good reason! Requiring low light and extremely infrequent watering, a succulent display can thrive under neglect like nothing else! That makes it the perfect plant for busy women! Since women always have too much on their to-do list, it’s the perfect decor that you don’t have to baby and take care of during the hustle and bustle of every day life! 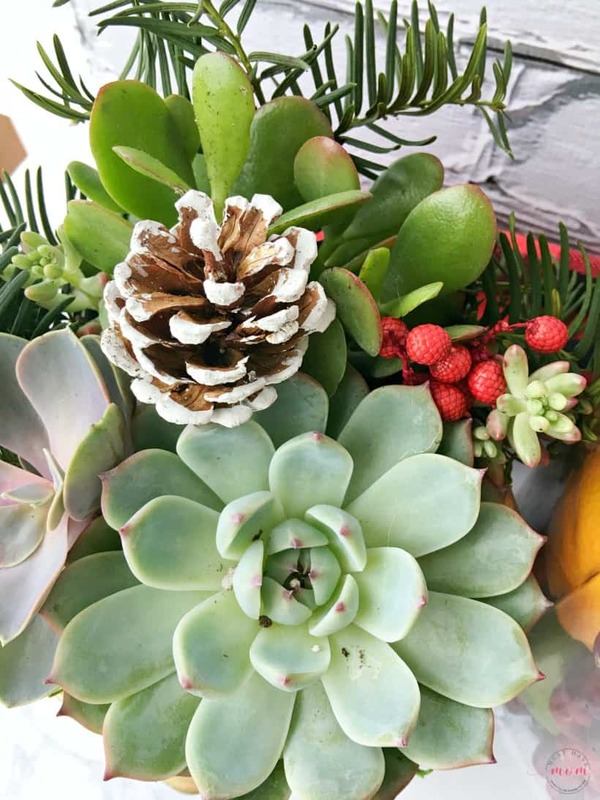 This succulent mixture includes both cool and warm tones in an arrangement of tightly-packed succulent rosettes. Place them near a sunny window for maximum beauty. While their minimum light requirements are fairly low, their best color happens in the sun. I was blown away by how beautiful this arrangement is. I love the heavy planter it came in too. 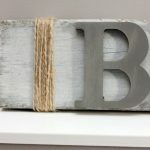 The grey and gold tones are perfect for my farmhouse style decor. Don’t forget to get one for yourself too! I couldn’t help but get one for me too because they are so gorgeous! Order from Jackson & Perkins and they will ship it straight to your door. It arrives wrapped in bubble wrap and beautifully put together. No assembly required, unlike other companies I have ordered from in the past. 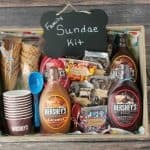 Celebrate Sundae Sundays With This DIY Family Sundae Kit Idea! 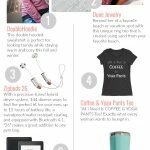 « Perfect DIY Coffee Gifts + 1 Day Keurig Sale! Such a perfect gift for all occasions! I’m over the top in love with your succulent basket. My teen grandson had a little plant that he named Henley but his mom took it over. Ha! This might be the gift he gets for Christmas! I just love this idea!!! It’s perfect as a hostess gift or even a housewarming! This basket is a great idea for the holidays and for a gift when visiting or going to someone’s house for dinner. It is something they would never get anywhere else. This would be the perfect gift for my sister in law. She loves succulents! They are her favorite plant! 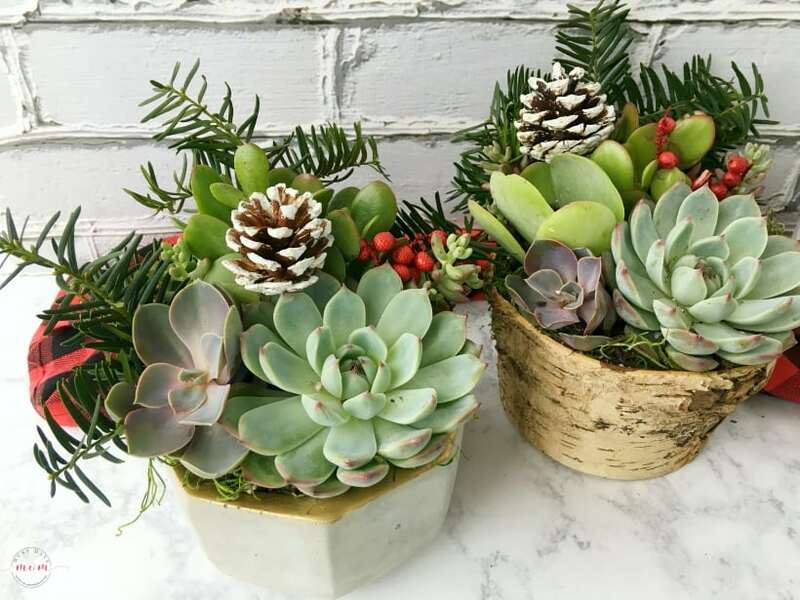 This Season Greetings Succulent Garden is a great hostess gift idea. I love to give a gift basket. They are fun to make. I think this is a great idea. I love it! I have always loved succulents. I don’t even have any, but now I need to get one! I love these ideas for gifts. I will definitely keep these in mind. Thank you for sharing. You’re speaking my language….how did you know these are my two favorite things?! Clever gift idea! Succulents are such a good gift idea. I really like the idea of giving a bottle full of everything someone needs for sangria! 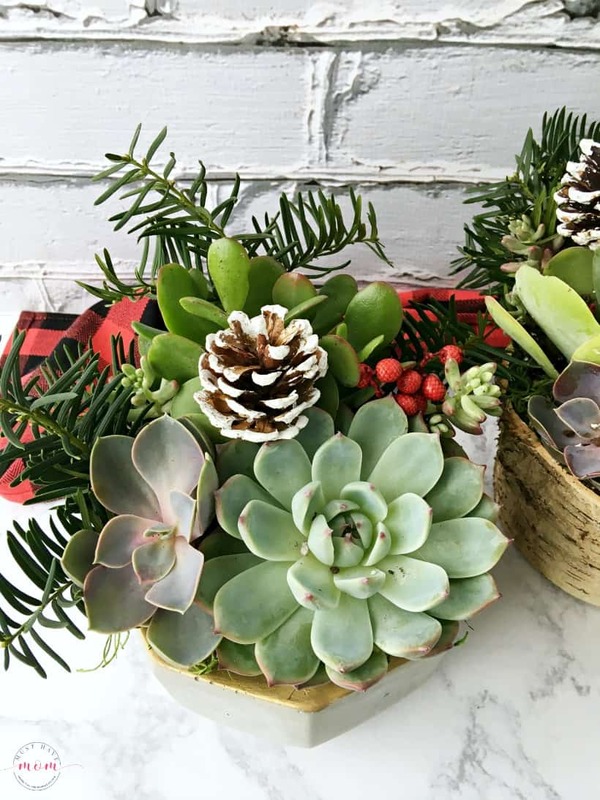 That Sangria and Succulents gift basket idea is so perfect for Christmas! I think it’s such a unique idea. Succulents make such great gifts. They are pretty easy to care for and are such attractive plants. Anyone would love to receive a basket of them. I love lasting gifts like this! I bet this would make an amazing hostess gift! Oh my HECK – I absolutely love this! Succulents are one of my fave things, seriously. 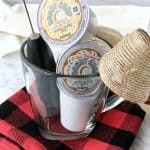 And that Sangria idea is brilliant – so many gift basket ideas are similar, but this is really unique, but still something anyone would love to get. SUch good ideas!! I love unique gift baskets and this one is so much fun! I have plenty of friends that would LOVE to get this one this year!! I’d buy that just to get that huge jar! It’s so cool and I can see using it for so many things! These are both cute ideas!! I really love the Sangria gift idea! This is such a cute idea. I will have to make one for my mom! Thanks for sharing! Love anything with succulents so you’ve got me! I have a friend who’s a huge Sangria fan. Pinning as her birthday is right before Christmas.